This article applies to users running Windows 10, and using the Microsoft Edge browser. There is no option on the message to prevent it from being shown in the future, so it will appear every time you want to start a session. 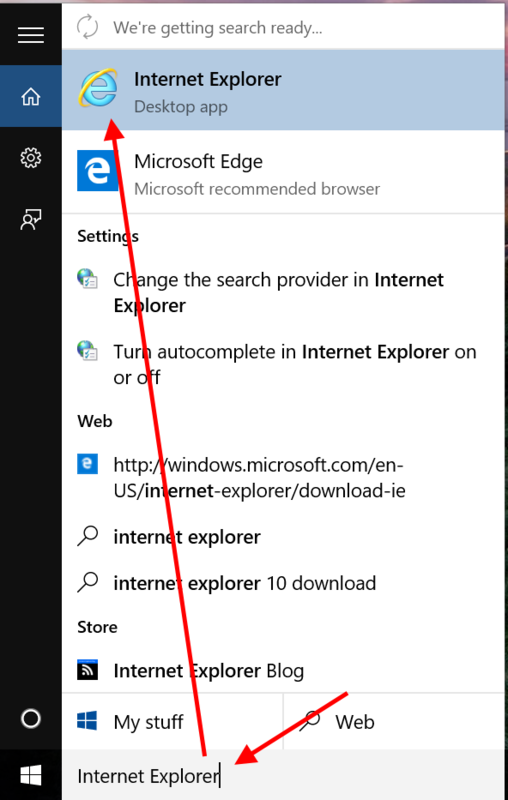 This support article will show how to disable the message from within Internet Explorer on your computer, which will cause this message to stop appearing in Edge. 1. In the lower left hand corner of your desktop, enter "Internet Explorer" into the search bar. Click on "Internet Explorer" when it appears in the search results. 2. Go to www.securevideo.com in Internet Explorer and click "Log In" in the upper right hand corner. If you don't have any sessions scheduled, you can always schedule a fake session. Please see this support article for tips. 4. On the next message that appears, uncheck the box next to "Always ask before opening this type of address." and then click "Allow". The next time you click on "Enter Waiting Room" to launch VSee in Microsoft Edge, you will not see the permissions message in that browser either! 5. If you're not starting a real session, properly close VSee by using the "Disconnect Session" button at the bottom of your Dashboard. 2. In the Internet Explorer browser, go to your email to open the "Join Session" link. Or select the URL from the top of the Microsoft Edge browser, and right-click to copy it, like in the below image. Then in Internet Explorer, double-click in the URL bar to select all the text, and right-click to paste. 3. Click the "Enter Waiting Room" button in Internet Explorer. Note: your provider's button might be a different color. 4. On the message that appears, uncheck the box next to "Always ask before opening this type of address." and then click "Allow". 5. If you are not waiting for your provider, properly close VSee by using the "Disconnect Session" button at the bottom of the waiting room page (underneath the "Enter Waiting Room" button). This article was last reviewed by our Support team on August 26, 2015.